NOTE: There is no October work party. Check at the email below when the next scheduled session will be. The Old Town State Historic Park Native Plant Landscape is located at the junction of Taylor and Congress Streets. It is across Congress Street from the Old Town Transit Center and north of McCoy House in the park. It is open 24 hours a day, seven days a week. There is no charge for entry. 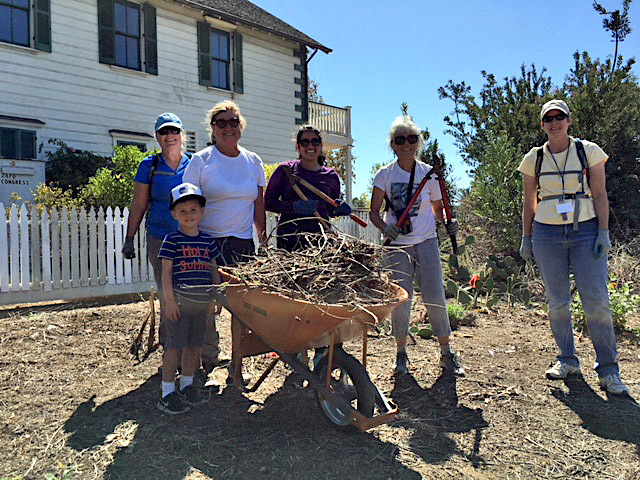 In 2008, more than 120 volunteers organized by The San Diego Chapter of the California Native Plant Society and the San Diego River Park Foundation took the first steps to reclaim a half-acre of vacant park land at the west end of San Diego Old Town State Historic Park. Most of this land was San Diego River bottom or flood plain and had no archeological features. But right at the top, where the McCoy House Museum is now located, the Native American village of Koss'ai (Cosoy) had been in continuous use for hundreds of years, if not thousands, before Spanish, Mexican and American settlers arrived in what we now call Old Town. The Old Town Native Plant Landscape is an educational project as well as a native plant restoration site. It re-creates a coastal native landscape that had provided for human needs for millennia. The project was enabled by a bequest from the estate of CNPS member Rita Delapa. CNPS has graciously matched her bequest with chapter funds over the years. CNPS member Peter St. Clair has led the project from concept to the present day. Peter engaged California Indian ethnobotanist Richard Bugbee who worked with Kumeyaay elder Jane Dumas and a number of tribal healers in California and northern Baja. They shared their knowledge of California native plant species used for food, to construct shelter, to make baskets, clothes, tools and medicine. 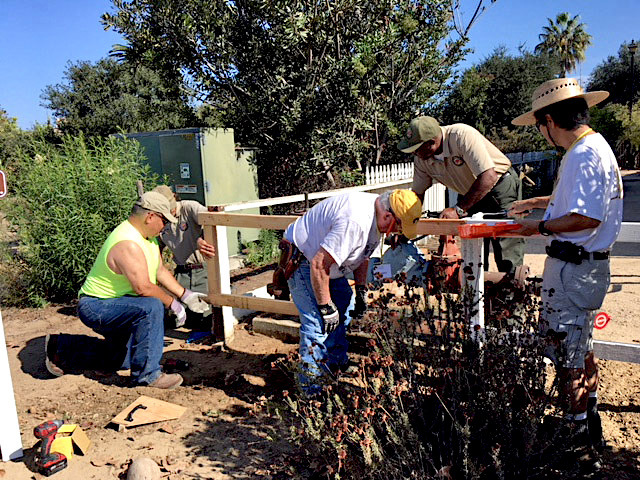 Recommendations were reviewed by California State Park planner and landscape architect Bob Patterson, state archeologists, historians, and State Park grounds supervisor Guy Raffetto. Planting and irrigation plans and an overarching vision for the landscape were created by Kay Stewart, a CNPS member and landscape architect. Visitors can use this map to locate ten of the three dozen kinds of useful CA native plants in the Landscape. After the initial joyous volunteer weeding party, irrigation was installed. Then another big event.brought in more volunteers, and 250 native plants were planted. Every year more plants have been funded by CNPS and planted, from large to small native trees of the coast, annuals, shrubs to grasses, rushes to bulbs. They are all useful for food, medicine, building, tools, even musical instruments, and for supporting wildlife that also are used by people who live off the land. The Landscape will take fifteen years to mature. It is growing into its vision thanks to devoted care and maintenance by CNPS members and other volunteers. CNPS coordinates maintenance work-parties at least monthly, year-round. Our volunteers give tours, including focused presentations for teachers who lead Fourth graders through Old Town. CNPS hopes to implement digital, cell phone and web-based learning tools in the near future. Every year since 2008 weeds are less abundant, and native plants occupy more and more of the Landscape. Native birds, squirrels, and even rabbits have made their homes there, recognizing the renewal of San Diego’s ancient environment. With your help and care this project will mature and achieve its goal around 2020. Old Town will have a new island of natural abundance, surrounded by the city. It will again link people to their native flora.